On Friday evening we grabbed groceries, and then made salmon, salad, and roasted brussels sprouts for dinner. We cooked up a new breakfast on Saturday, and then that evening we went out on the town. Christopher's parents had given us a gift card a while back for a local restaurant, Memories, so we got dressed up and went out to use it. It included lamb, ribs, potatoes, spanakopita, dolmades, and calamari. Mmmmm - such a satisfying dessert. We had a lovely evening out! They are so filling that we didn't need to eat much else until dinner, when we roasted a turkey. We just had a simple salad on the side, then stripped all the meat off, and put it in the fridge to use for meals for the start of the week. Yesterday we used some of the turkey to make a casserole, loaded with kale, peas, fresh herbs, roasted mushrooms, and gravy. We topped that with cornbread Stove Top Stuffing, and baked it. Dinner tonight included turkey sandwiches and huge salads. How was your weekend? How's your week going? This morning we tried some new recipes for breakfast. We made a paleo/ gluten-free pancake, which has a bizarre ingredient list, but actually works - trust me on this. Mix together the mashed banana and beaten eggs. Add the flax, vanilla and cinnamon. Stir. Spray or grease up a small frying pan, and put it on medium-low heat. Once hot, pour in the banana/ egg mixture, and let set in the pan for 10 minutes. Don't touch it during this time. Once firmed up, carefully flip it and cook about one minute on the other side. It turns out very pancake-like. We also made sweet potato shredded hash browns using this recipe. They got pretty dark on the outside, but didn't taste burnt at all. They're really delicious. We dipped them in a bit of sriracha. 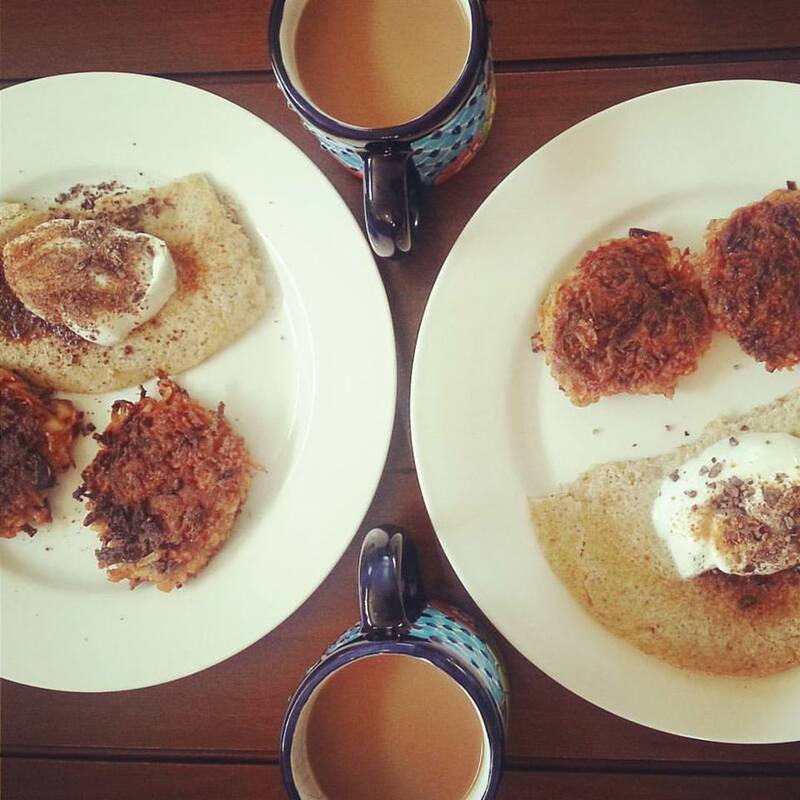 We topped the pancake with Greek yogurt, a sprinkle of coconut sugar, and cacao nibs. To drink we tried some of the exclusive coffee blend that our friends' Bonnie and Warren had made for their new coffee shop, Mocha Grande Brew, which is located in Parksville, British Columbia. I worked with Bonnie for many years, and she always talked about opening a coffee shop. She had the wheels turning for a while, and has now made her vision a reality. Her and Warren completely overhauled an old coffee shop in Parksville, re-branded, re-decorated it, and re-designed it to bring a new flavour to Parksville. They are across the street from the water, and have a beautiful patio - a perfect place to grab a brew and relax. They serve up a variety of hot and cold drinks, soups, sandwiches, and many different types of baking/pastries. They also sell packages of their exclusive coffee blends, Ethiopian, and Valley Girl. The coffee is fair trade and organic, which made us really happy to see. It comes in both 1/2 lb and 1 lb bags to take away and brew at home. We haven't actually got to visit the coffee shop yet, as it's a couple provinces away, so we're happy to be able to have a taste of it at home. I'll be honest, we might have squeezed the bag, with our noses up near the vent about a 100 times - smells so good. Once we ground the beans, the aroma was even more enticing. We ground the Valley Girl beans fresh this morning, and brewed a big pot to enjoy with our breakfast. It was excellent! We drank the whole pot up in no time, and are already looking forward to another pot tomorrow. It was smooth, and not overly bitter like some coffees are. If you're ever in the Parksville area, stop by Mocha Grande Brew and say hello to Everyday Foodie pals, Bonnie and Warren. 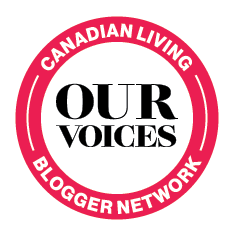 For us January has been a month of using things up from the fridge, freezer, and cupboards. We haven't spent a lot on groceries, other than fresh vegetables. We did come into a lot of free pomegranates. Like a lot. About 60 of them. Needless to say, we've been eating a lot of pomegranate. We enjoyed some in our oatmeal on the weekend (made with coconut water and coffee). Other toppings included coconut, ground flax, peanut butter, hemp seeds, bee pollen, and a few dark chocolate chips. I threw some pom arils into my breakfast smoothies earlier this week, along with organic frozen cherries, aloe, coconut water, ground flax, cocoa, vanilla, and a scoop of red veggie powder. Dessert every day = pomegranate. 60 might seem like a lot, but when we're each eating about 1.5 a day, they'll be gone in no time (i.e. 20 days). Pomegranates are Christopher's favourite fruit, so he's pretty pumped. Dinner on Monday evening was chicken noodle soup. We roasted a chicken on the weekend, so we used the bones to make the stock. On Tuesday evening we made pita pizzas topped with pepperoni, mushrooms, green olives, arugula, and cheddar cheese. This evening we made a shrimp, Thai curry, which we served over rice. We have nothing planned for dinner tomorrow, but we'll raid the freezer and figure something out. It's nice to use up random ingredients, and things that have been in the freezer for a while. We always buy a lot in December, so we decided that January is a good month to drastically limit what we bring into the house (not only food, but anything). It's basically a no-spend month for us, other than necessities, and a no-going-out month too (unless we have gift cards, or are out of town). We're excited not to leave the house this upcoming weekend #hermitlife. We love to eat plant-based meals, as we know the health benefits of a plant-heavy diet, and we haven't met a vegetable that we don't like. I recently received some products from the people at Yves, and was excited to try them (I think Christopher might have been even more excited. He will always choose a veggie burger or veggie dog etc. over the meat alternatives). This week we tried the Kale and Quinoa Bites. These appetizer bites are vegan, free from gluten, cholesterol, artificial preservatives, artificial flavours and colours. They are a good source of fiber, packed with vegetables, and are non-GMO. They're a breeze for a snack, as you just toss them in the oven for 10-11 minutes until heated through. 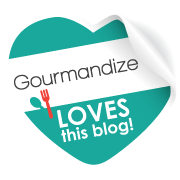 We enjoyed them dipped in tzatziki sauce. They have delicious little flecks of kale and carrot throughout them, as well as potatoes, onion, quinoa, chickpea flour, spices, and ginger - mmm! 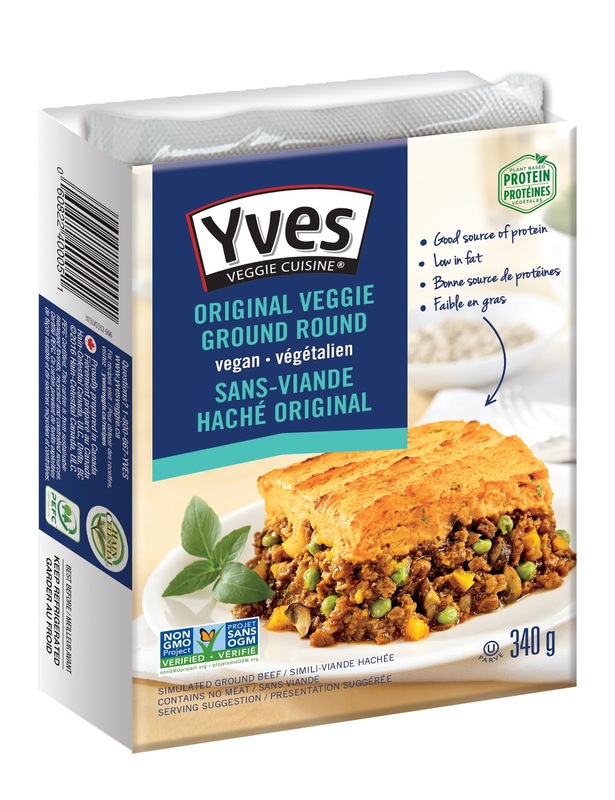 This week we also tried Yves Veggie Ground Round. Ground round is a great vegan alternative to ground beef. I recently found out that my mother-in-law always uses it in her lasagna, which I didn't realize, even though I've had her lasagna a few times. It's got the same look and texture as ground beef, and is clearly quite indistinguishable from the meat when used in a dish. I've used ground round many times in spaghetti sauce, lasagna, and chili. It's a good source of protein (9 grams per 1/3 cup), a source of fiber, non-GMO, cholesterol-free, artificial preservative/flavour/colour free, and has 90% less fat than regular ground beef. We used it to make spaghetti sauce for dinner. 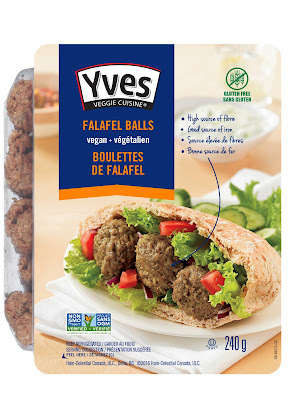 The third Yves product we tried were the Falafel Balls. These Middle-Eastern vegan bites are filled with chickpeas, onions, carrots, herbs and spices. They are great on their own (just heat and serve), or in a pita, sandwich or wrap. They are a good source of fiber and iron, and are free from gluten, cholesterol and trans fat. They, like the other products we tried, are also non-GMO. We enjoyed the falafel balls in whole wheat pitas, with tzatziki sauce, Greek salad, and mustard. We're huge fans of falafel, and have made falafel pitas a few times before. Falafel is traditionally served with tzatziki, which is traditionally made with Greek yogurt. However, if you don't have Greek yogurt on hand, you could also make it with sour cream. 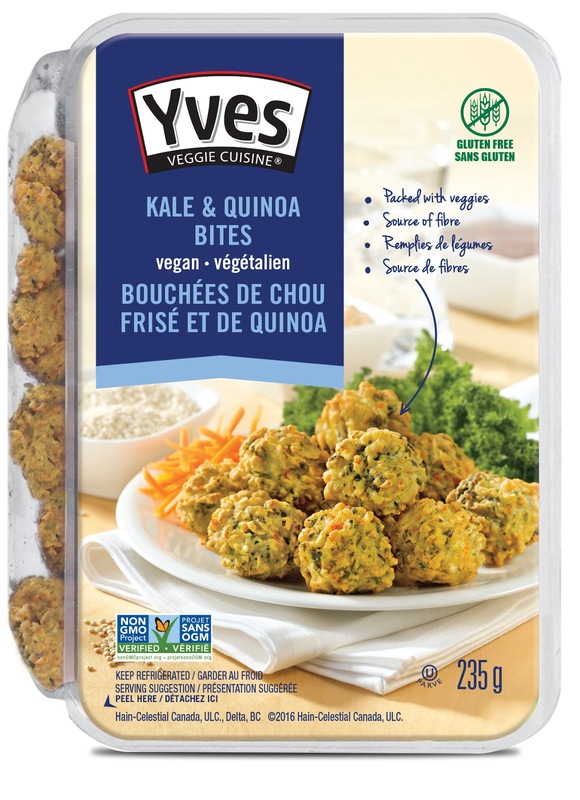 Mix together and enjoy with Yves Falafal Balls, or Yves Quinoa and Kale Bites, in your pitas, etc. Have you tried any Yves Veggie Cuisine products? Do you try to incorporate plant-based meals into your diet? * The Yves products in this post were provided to me free of charge. All opinions are my own. * High-resolution images of the products provided to me by Yves. Other photos are my own. Last week was so unbelievably cold, and just draining overall. I'm still not convinced I've thawed out yet. On Friday morning I tried to feel a little more tropical, with a banana, pineapple, and coconut water smoothie. On Friday evening we drove to Saskatoon, ate a very quick dinner, and were in bed by about 8:30 p.m. On Saturday morning we had breakfast in the hotel before heading to spend the day with my mom. We had a long day of visiting, attending my mom's care meeting, grabbing her groceries, and visiting some more. We didn't eat again until dinner, when we decided to try Bon Temps, which was close to our hotel. The restaurant is gorgeous, and the service was great, but unfortunately we didn't enjoy our food. It's a southern/ Cajun style restaurant, however the po boys were not even close to what we've come to know as po boys. They were extremely dry, which is never good for a sandwich, and the bread was super hard. Christopher had the shrimp po boy, and I had the peacemaker, which was supposed to be topped with roast beef debris. Roast beef debris is typically dripping with gravy, and po boys are usually on soft bread, with a lot of mayo or sauce. The bread is not usually toasted or hard. The roast beef was so dry, as was the entire sandwich. I'm guessing the owner/ chef of this restaurant has never actually had a proper New Orleans po boy, but I could be wrong. The restaurant has good reviews, so perhaps other things on the menu are better - don't know if we'll try it again though. After dinner we were back in our hotel for another early-to-bed night. We were up bright and early on Sunday, and we went to Grainfields for breakfast. We got another breakfast on our way out, so that we could take it to my mom. She especially loved the buttermilk pancakes. After having a nice morning/ afternoon visit with my mom, we headed out on the highway home. Once back in town we stopped at Christopher's parents' house, as they had invited us over for dinner. The meal was so, so good, and super filling. I think I still might be full. We had prime rib, Yorkshire pudding, roasted potatoes, Brussels sprouts, carrots, parsnips, and cauliflower. This was such a perfect Sunday meal, and to top it off, we had carrot cake for dessert. I feel like we've been going, and going, and going. We're looking forward to doing a whole lot of nothing for the rest of the month. We got home from Mexico late on Saturday evening. On Sunday we hit the grocery store and bought a cartload full of vegetables. Our meals this week have been almost exclusively plant-based. Breakfasts have been smoothies with coconut water, fruit and cocoa. We had Thai bowls for dinner one evening, with a bit of jasmine rice, cooked tofu and mushrooms, raw veggies, and a coconut curry sauce. We made extra to have for lunch too. Dinner another evening was a roasted vegetable salad over arugula and pea shoots. The juice was great with a quinoa veggie bowl, topped with a chickpea/ almond butter sauce (also included lime, curry powder, garlic, nutritional yeast, salt and pepper). One meal this week that wasn't completely plant-based was chili, which was such a perfect meal to warm us up. The weather this week has been ridiculously cold - so cold that there have been severe weather warnings (-49), and school buses have been canceled. Blah! This evening we enjoyed a plate of raw veggies, and some leftover quinoa for dinner. We're looking forward to a little weekend getaway, and hopefully a break from this cold. How was your week? Any big plans for the weekend? Excellence Riviera Cancun is an adults-only resort, and there are no tacky bracelets/ wristbands. 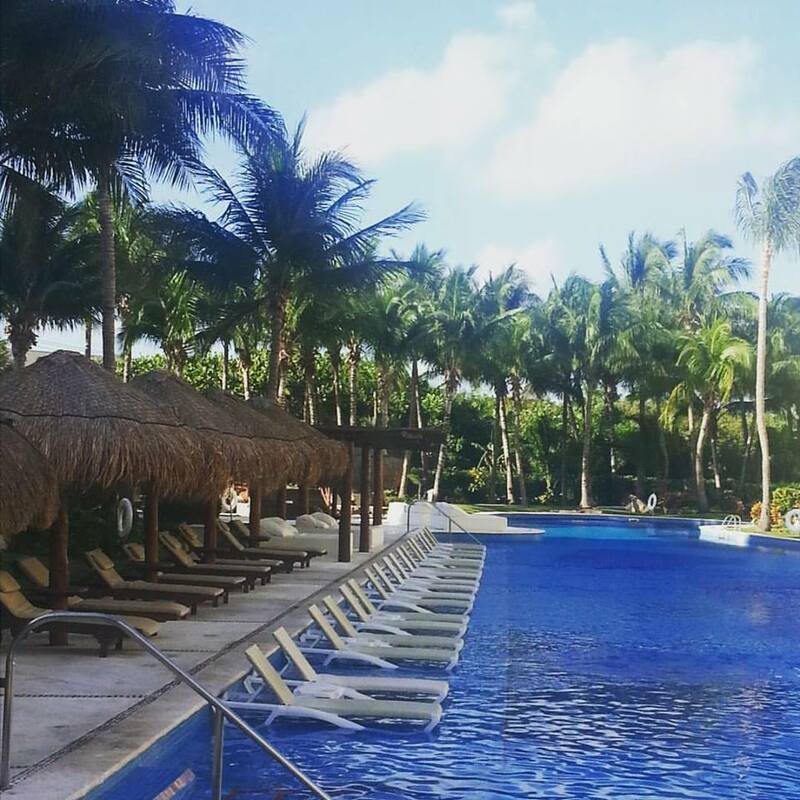 This was our first time at an adults-only resort, and it's the only way we're doing all-inclusive trips from now on. The service is outstanding at all times. As for aesthetics, it felt like a Vegas hotel was transplanted in Mexico. Outdoor walkway, leading up to the front entrance. The grand marble staircase, leading up to a seating area, coffee shop, front desk, and main entrance. Martini bar with extensive menu, not just martinis (gets happenin' at night). Seating area upstairs (opposite from front desk). We loved the brickwork around many of the light fixtures - so pretty. The resort has 440 rooms (668-2000 sq feet), and was at 98% capacity when we were there, yet it never seemed busy. Most of the time we had the pool near our room to ourselves. There are numerous pools, and only the pool with the swim-up bar seemed to be a bit busier. Servers came around to all the pools, and even to the yards at the swim-up rooms. Loungers around the pools were available in abundance, either in shade or full sun. There were many, many floater mats for floating along the pool or lazy river. There were also towel stations around each pool to get as many towels as desired (no chips, no trading them in, no one working at the towel stations). You could take whatever you wanted, return them, or leave them in your room, or on the chair, or whatever - they were always cleaned up quickly and taken away when not being used. We loved alternating between reading in the shade around the pool, and getting some sun on our day-bed. We had a swim-up room, which gave us our own private yard, with a day-bed, seating area, hammock and outdoor Jacuzzi. The room itself was spacious, and functional. There are so many different places to go and to be, that nothing ever seemed crowded. The beach was busier during the day, but not crazy. Also, there was no one hanging around on the beach trying to sell anything, which was nice. There was wonderful entertainment in the day and evening. We enjoyed quite a bit of live jazz music by lantern-light, and a fun dance party on New Years Eve (as well as our own dance parties in the room, on the beach, as we walked to dinner, etc. haha). The seating for the evening shows (after the live music) was very comfortable. Although we didn't catch any of the 9:00 shows, we did hang out in the chairs earlier in the evenings just to relax and visit. Overall we had an absolutely amazing vacation, and missed some freeeeeezing weather at home. We polished off a few books on this trip, and did a whole lot of relaxing. Unfortunately we had to come home on Saturday to freezing weather, which doesn't seem to be letting up. And in crappier news, today someone hit my car. Womp womp. Anyway, other than that, we're happy to be home and back into routine, but will definitely return to this beautiful resort in the future. Warm getaways are just too good when dealing with prairie winters! Do you have any trips coming up this winter? Or maybe something to look forward to for this spring?